If you are a student focused on achievement, our academic enrichment programswill meet your educational goals. We are eager to help students get ahead in core subjects, such as math or English, whether it’s through a tutoring program or a summer course. The Beekman School offers an extensive range of educational options for students who wish take a class that is either unavailable at their current school or cannot be worked into a traditional school schedule. We offer enrichment classes through small groups or during one-to-one learning so students have the opportunity to strengthen skills and master challenging subjects. Our experienced educators can jump-start your knowledge and support your progress. At Beekman, we help you get ready for the rigorous subjects you plan to take in the future, be it during high school or college. Let us partner with you in preparing for college or the next school year, utilizing effective programs for academic achievement. You do not have to attend our school to benefit from our exceptional tutoring programs. We offer high school enrichment classes through The Tutoring School that can broaden your understanding of a subject. These programs include standardized test prep, a crucial part of the transition from high school to college. In classes, students gain an awareness of standardized test subject areas and formats. 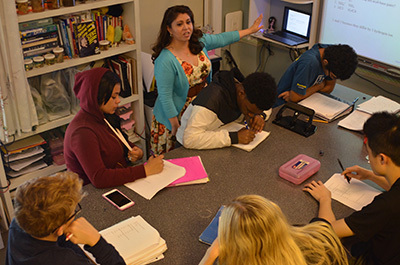 The Tutoring School’s extensive scope of enrichment classes for high school students is also an educational asset before a midterm or final exam. During these times, our one-to-one learning center can guide your review and reinforcement of class materials. We invite you to contact our New York private school today to learn more.